Roland has a new horse in the analog monosynth race. Today, the legacy electronic equipment company announced that the newest edition to its hyper–compact Boutique series would be the SE–02, a three–oscillator analog monosynth to be listed at $499. This is Roland's first integrated analog synth since the release of the JX–10 and its rackmount version, the MKS–70, in 1986. Roland has really aced analog modeling in digital technology with its Analog Circuit Behavior synthesis (used in the other Boutique series synths and its Aira line), so it's a bit of a surprise to see the company shifting to offer an authentic analog circuit. The SE–02 sits alongside the Korg Monologue, Novation Circuit Mono Station, and Moog Mother 32 as a small–footprint fully featured analog synth with a flexible 16–step sequencer. The SE–02 has more bells and whistles than the Monologue, while it lacks the semi–modular, deeper level control of the Mother 32. It's also worth noting that the Mono Station's focus on grid control positions it as a thoroughly 21st century tool for beatmakers and electronic producers, while the SE–02's swath of knobs and classic step sequencer hearkens to the vintage. Roland enlisted Studio Electronics to help design the synth, and the naming scheme suggests that this is the evolution of the SE–01 — Studio Electronics’ own analog monosynth that was a tribute to Moog’s oscillator circuitry featuring an Oberheim filter. The SE–02 should be shipping from retailers soon. 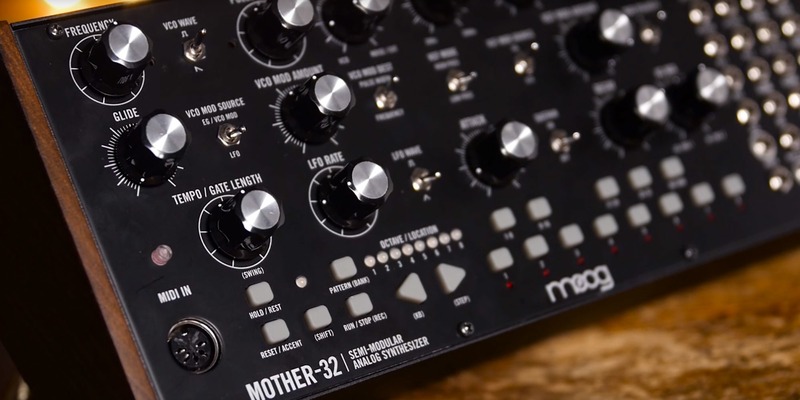 The Moog Mother-32 semi-modular synthesizer captures the legendary Moog sound at an unprecedented price point while tapping into Moog’s modular legacy.